Pablo Picasso once told art historian Roland Penrose that Cubism was "full of deception" so that it would keep people looking and guessing and looking again. Apparently his tricks worked -- Cubism is more than 100 years old and we are still confounded -- but at the Santa Barbara Museum of Art recent technology is enabling museum-goers look at Cubist works with astonishing acuity. "Picasso and Braque: The Cubist Experiment, 1910-12," an intimate exhibition of some 15 paintings and 25 prints, is making rare Analytical Cubist paintings available for both physical and virtual inspection. Visitors to the show can borrow one of forty iPads equipped with a specially developed iCubist application to scrutinize and delve deeply into four key paintings. Inside the app are digitized spectral images that show the works at different light frequencies, including ultraviolet and infrared, to reveal minute details. The app also allows users to take apart and reassemble Cubist compositions, and provides pop ups to help distinguish the individual styles of each artist. Pablo Picasso and Georges Braque, who collaborated to move Cubism forward in its early days, saw themselves as having a kinship with scientists and inventors. In homage to the Wright brothers they used to jokingly call each other "Orville and Wilbur." The Santa Barbara show features works made by the pair between 1910 and 1912, a precious period of innovation and cooperation that was halted by World War I. In the 1920s, when Picasso found that he missed working with Braque, whose artistic career had been slowed by wartime head wounds, he wistfully referred to Braque as his "ex-wife." 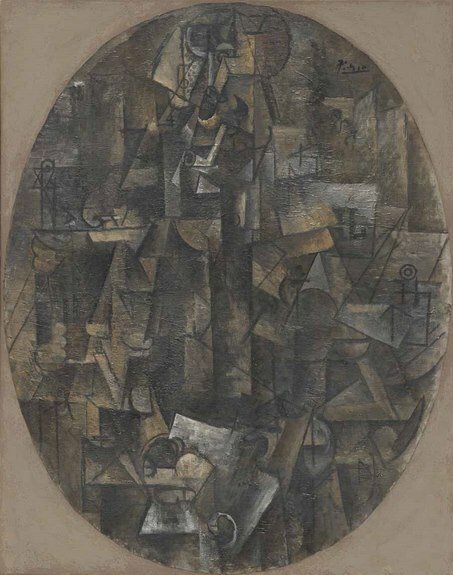 One of the works in the Santa Barbara show, Picasso's "Man with a Pipe" of 1911 is an Analytical Cubist riff on the image of a man in a smoky cafe, but as the iCubist app will reveal, it started out as a still life. There are hints of a moustache, hands, clay pipe and a few letters thrown into the jumble, all of them floating on the jagged jigsaw puzzle forms that give the painting its visual rhythm and inscrutability. Are there still bottles and cups lurking beneath the faceted coat of Picasso's Cubist gentleman? You'll have to look it over in person, and on iCubist, and decide for yourself. SBMA's Chief Curator Eik Kahng comments that "The spectral images we will show of Picasso and Braque's paintings allow you see the trace of the very hairs of the brush in the paint layer. They can be truly mesmerizing." Kahng feels strongly that Ken Boydston, who developed the "MegaVision" technology used in capturing the digital images is "nothing short of a visionary." In essence "The Cubist Experiment" is a show about artistic visionaries, whose work can be better understood using the tools created by the digital visionaries of our own time.